You Don’t Have To Crouch To Carve If you love the idea of a sportbike, but favor a more classic riding position, this is your Honda. The CB500F is spec’d out with everything you want in a modern sportbike. From its 471 cc powerplant to Programmed Fuel Injection (PGM-FI) to aggressive drilled disc brakes to its unique Honda Pro-Link® rear suspension, this is a sportbike built to carve corners, but not cut them. And with its light weight and low seat height, it’s the perfect choice for riders ready to move up to a bigger motorcycle. Strong and stylish, the CB500F's 12-spoke cast-aluminum wheels are easy to keep clean, look great and are another CB500F feature that just makes sense. Honda twins are famous for their versatility, and the new CB500F engine is one of our best ever. Using the same piston bore size as our CBR600RR sportbike, the parallel-twin engine offers accessible performance across all RPM ranges. A sophisticated chassis with Honda Pro-Link rear suspension, nine-stage preload and 4.1" travel give you a comfortable ride over small bumps, while capably absorbing bigger bumps to increase riding comfort and handling. A motorcycle's frame is the basis for its handling. A new take on a classic construction, the CB500F's diamond-shaped 35mm steel-tube mainframe ties to the engine with four mounts, offering a rock-solid foundation for a superior ride and handling. The new CB500F offers a step seat with a low height. Perfect for around-town riding or out in the canyons, it also offers plenty of room for a passenger and is specially designed to fit a wide range of riders. Less is more when it comes to the new CB500F. 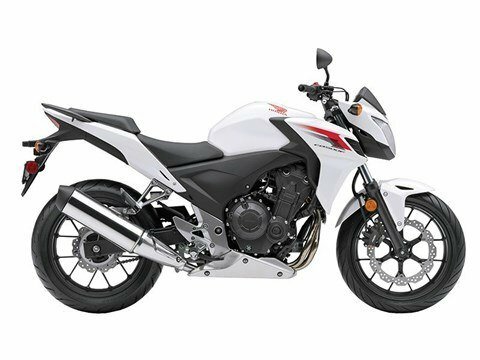 Featuring classic, clean, progressive style, the CB500F is a motorcycle that looks great while still providing incredible value and performance.